This was the Server where the final Payload of my analysis (staged in 2 Droppers) was downloaded. This is the Server where the final Payload of my analysis uploads the (encrypted) information it has gathered. This is the Server of the older version of this malware (see below). We know that each individual directory a malware sample contacts, is hardcoded into it (e.g. "/~bint/" -> see Part 3). We also see that the used directories have 2 to 4 characters in front of the character "~". I think the directories "/~mailnull/" and "/~operator/" are used by the attacker for other purposes. So we have in total 27 (200.74.244.118) + 19 (70.85.221.10) = 46 malware samples from these 2 (known!) Servers. If we consider the purpose (information gathering, keylog, ...) and the used Exploits of the older sample (see https://www.symantec.com/security_response/writeup.jsp?docid=2011-090714-2907-99&tabid=2 -> CVE-2009-3129, CVE-2010-3333), I would claim this malware was and still is used for targeted attacks. Unfortunately I am unable to do any further analysis (who are the victims? ), since I am not working for an AV company. Regarding the whois information of his newer domains (200.74.244.118 and 200.74.244.118 -> see Part 1+2 in Appendix), where no public traces were left, I consider these domains as something from his past. Since this older variant uses various techniques already seen in the newer one, I will only show some notable parts. At first we can see that there are 10 "NOP" instructions between some code blocks. 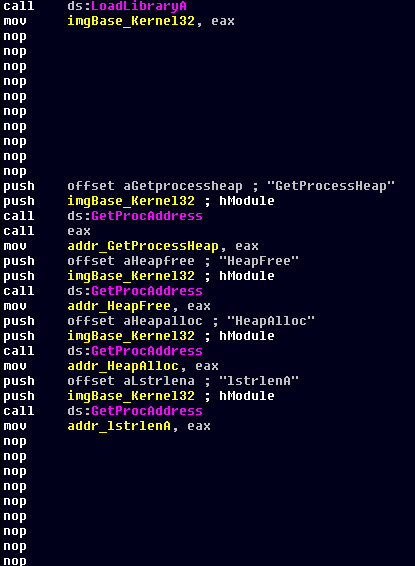 The purpose for these NOPs is unknown to me, maybe it has something to do with the used Exploits (see above). Another idea is that they are used for fooling AV signatures to prevent detection (maybe in other variants these NOPs are garbage code). The most interesting part is the network communication with the Server. The malware uses a technique which was unknown to me, but it turned out that it is a very old method. 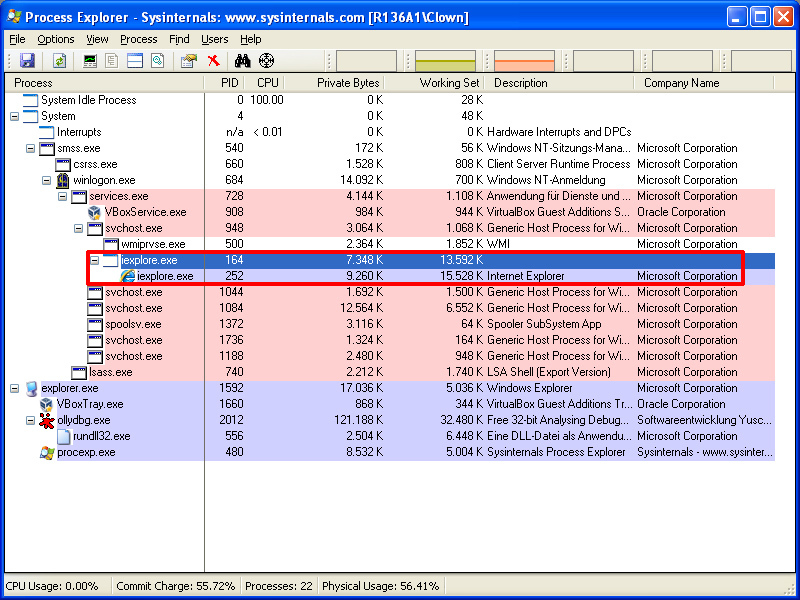 It uses the COM (Component Object Model) to create an invisible instance of the Internet Explorer (iexplore.exe). The purpose of this older variant is to download the file "msmvs.exe" from Server and execute it. So it's similiar to the newer variant, except that it isn't encapsulated in a Dropper. I think I might have asked before - Don't suppose you saved a copy of those files on the open server and would be willing to share with other security researchers?